You can add a little inspiration to everyday if you'll put these where you need the most - home, school, gym, work - wherever you might see them often. Its an age old rule. You are what you believe. These posters fill your mind with drive and inspiration for the day. NOTE: They are NOT Framed. Frames are not included. They are 12 x 18 inches. They ship in a study 3 inch tube. Order today! What you learn in school will shape the rest of your life. Rules for School (and life). MOTIVATIONAL QUOTE WALL ART. 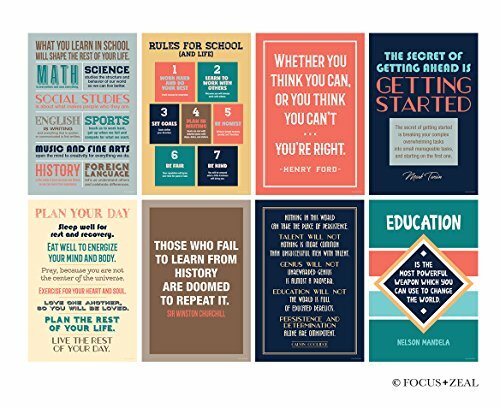 These posters provide motivation, inspiration and drive for the home, office, gym, workout space classroom or dorm room. READY TO FRAME. 12 x 18 inch posters are high res digital prints on 100# paper. Ready to frame. Frame not included. GREAT GIFT IDEA for students, teachers, classroom, entrepreneurs, kids, parents, friends, housewarming, office, home gym or more. Perfect for Back to school. CLICK FOCUS AND ZEAL ABOVE to see all of our unique quote posters. Copyright FocusandZeal.com (c) 2018 All rights reserved. If you have any questions about this product by Focus and Zeal, contact us by completing and submitting the form below. If you are looking for a specif part number, please include it with your message.